Tool Tip Manager is a CRM 2013 Online and OnPremise managed solution that allows a CRM Product Manager to quickly, easily and risk free to customize the form attribute tools tips for their system. Tool Tip Manager is offered as a free, complementary solution to the CRM community. No license is required. 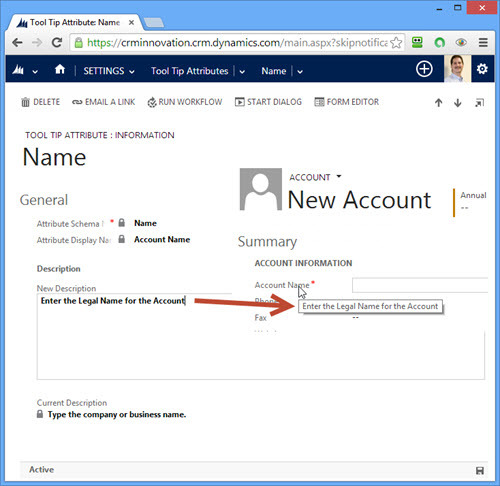 No longer do you have to access the system via the customization interface to go through each attribute. This reduces the risk that while you are editing the tool tip for an attribute that you accidentally make a change to another setting for the attribute in error. There is also a self-documenting process whereby you can use a View to show all the attributes for an entity and their tool tip. The current release of the product supports the English language implementation, although you can create the tool tip in any language. There can only be one tool tip per attribute. Nor can you insert anything besides plain text – no HTML or images. There are limitations inside of the CRM system that we need to abide by. This product was developed in accordance with the CRM SDK and it only uses fully supported methods. We did not use any unsupported methods or hacks. We are asking that you register with us for the product so that we can notify you of any new releases, bug fixes, etc. We won’t use your information to communicate with you for any other purpose nor will we share, sell, rent or otherwise disclose your information to any other third party. You will need to provide your corporate email address, we will not send the download link to ‘free’ email addresses. This solution is totally complementary. Our firm has been implementing Dynamics CRM since 2003 and we have had great success. We created this solution for the community as a thank you. Note: if you install the solution and use it to customize the tool tips for your organization and then remove the solution it does not remove the customizations you made to the attributes. The Installation and User Guide is available without requesting the managed solution. You must provide a corporate email address. Public email accounts aren’t accepted.